Autumn is my favourite season, it's mild, crisp and cosy. I love everything about it, from the warm knitted jumpers, darker evenings, hot chocolates and pumpkin picking to crunchy leaves underfoot and bonfire night. There's a lot that happens during Autumn and the build up to Christmas slowly looms. 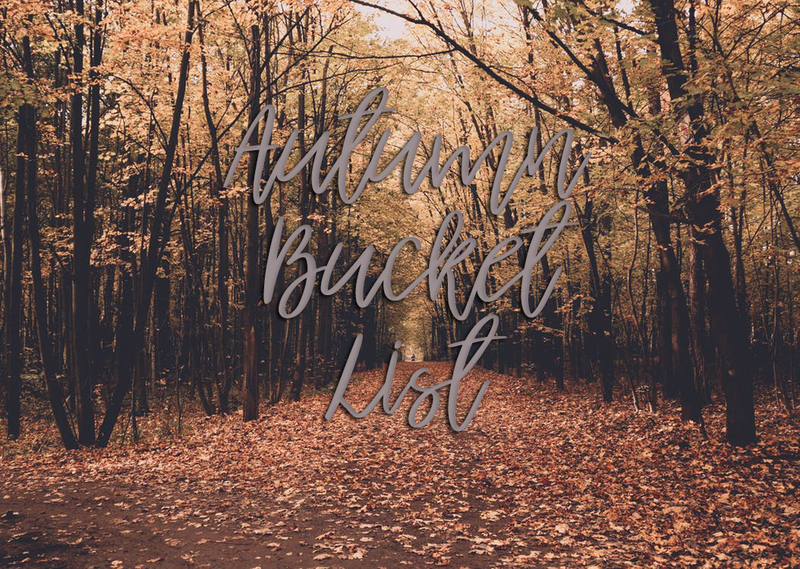 This Autumn is no different to last, and I have a set list in my head of things I want to do as a family. Last year Autumn was amazing for us, my blog really started to hit the ground running, my health fears over Patrick slowly drifted away and we really got into our grove as a family of four. As you can imagine, this year I'm holding out high hopes. We do have our solo holiday at the end of September before I can really start feeling autumnal, as it's hard to think about scarves and gloves when you're packing a suitcase full of bikinis. But it's nice because that really will be a metaphorical line under the sand for the end of summer and start of our Autumn adventures. As with my previous bucket lists, I don't expect to get everything done, but it's nice to have a little reminder as there's nothing worse than it coming to the new year and thinking 'Oh, I forgot I wanted to do that'. One last Sundown Adventureland trip before it's too cold. Ensure my parents have fireworks at their house again. Buy as many fall scented candles as humanely possible. Be prepared with winter coats for everyone. It doesn't seem too much, but I think that's just enough to see us through the Autumnal months. Last year Pumpkin picking was one of our most fondest memories of Autumn, it was our first outing after a really rough September rife with chicken pox, so it felt like a taste of freedom again. The air was crisp and the ground was crunchy, that's exactly what I'm hoping for again this year. As always, I'll be editing this as I go so you'll be able to see which things we have managed to achieve and which we haven't.